I came across an old newspaper clipping from 1961 the other day. It was an advertisement for an open house at Community Arts Center. It mentioned that they offered classes in not only painting, drawing and sculpture but also classes in language, drama, music and dancing. I found it interesting because I don’t think there are many arts centers today that offer visual as well as performing arts instruction all under one roof. Why don’t more arts centers offer more visual and performing arts all in one place? Could it be because the arts are a little more fragmented now with each individual discipline having its own studio, space or center as its classroom? Or because public funding for all arts activities is decreasing a bit so maybe organizations are finding it more cost effective and wiser to focus on one specific area of study? Or are we not teaching our children enough about the importance of the arts and the creative process in general? Not sooo long ago, it seems like the arts, and I include visual, performing and literary arts here, were important to explore. Participation in all forms of art were not only expected but encouraged. Arts education was critical to the formation of well-rounded citizens and societies. Do you think this is still the case or are our views of the arts different today? 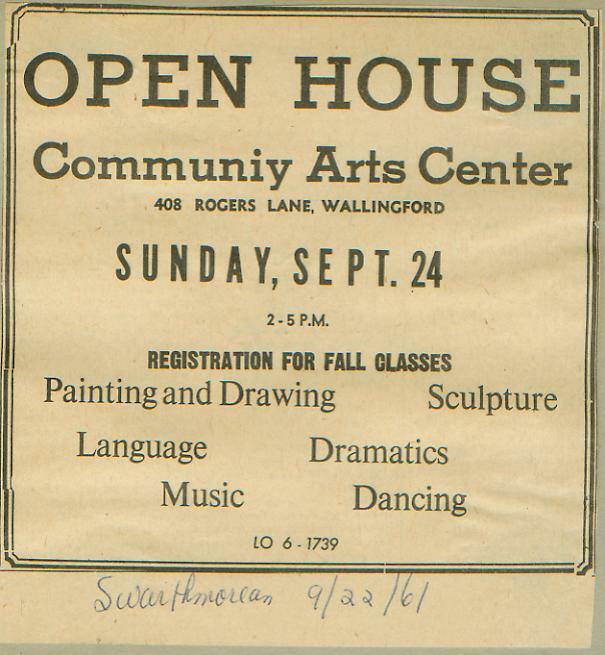 Community Arts Center advertisement from 1961.